So many hobbies, so little time. On to the fourth post in my series of how to play all 14 Ultima games on a modern PC. As always, for this post I won’t get into acquiring the game files, installing DOSBox or justifying why do this myself when I could just get the games via GOG. Please see my first post, on Akalabeth, for my comments on those things. Go here for previous games I have covered: Ultima II and Ultima I. Before we start I have a confession to make. I really do not love Ultima III. I think it has all the difficulty of Ultima IV and V without any of the story progression given by the later games rich dialog systems. Now that I got that off my chest, goes how to play Ultima III on a modern PC. 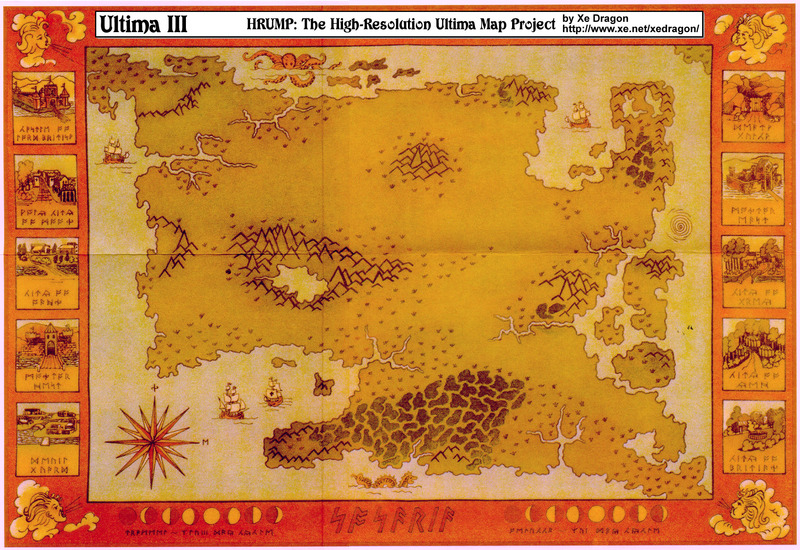 Off to the High-Resolution Ultima Map Project and here is the link for the Ultima III map. Next is the manuals. Ultima III actually has three manuals: the manual, the book of cleric spells and the book of wizard spells. All three can be found at replacementdocs.com here, here and here. The DOS version of the Ultima III Player Reference Card is something I don’t think I have ever actually seen. The closest I could find was the Commodore 64 version found here. Besides the direction keys its close enough. Again, this is simple. Copy all the game files to your machine. Choosing a path that only contains folders with less than 8 characters and contains no spaces will make your life easier in the next step. For reference, I always choose “C:\Games\ultima3”. We are going to install The Exodus Project’s Ultima 3 Upgrade patch. If you want to play the game in all of its 4 color glory and risk your eyes bleeding you can skip this step and when you want to execute the game simply execute ultima when I say to execute ultima3. You can also choose to run the upgrade patch in 4 color CGA by configuring the graphics mode via the u3cfg executable after install. Let’s install the patch. Download the patch from here. Copy the contents of the zip file into C:\games\ultima3. Double-click u2upw or u2upw.exe in C:\games\ultima2. There is a really good chance Windows is going to throw up a window letting you know this executable may be dangerous. To get around it hit the “More Info” text on the dialog and then a “Run Anyways” button will appear. Once launched hit ‘Y’ to apply the upgrade. Now the default settings are what I have traditionally played with, but with the release of the latest upgrade release there is an intriguing option to consider. There has always been a bit of discrepancy with the maps not being the same between Ultima 1, 2 and 3. So now there is an option to make the Ultima 3 map the same as the Lands of Lord British from Ultima 1. If you want to enable this map mod you need to double-click u3cfgw or u3cfgw.exe (again you will probably hit the dangerous executable warning) and choose option 8 (which will toggle the map) and the hit S to save and quit. You can switch back and forth between maps anytime, but be aware that the two maps share separate save game data. Fire up DOSBox and execute the following commands. If you installed the upgrade patch then there is no need to reduce the CPU cycles with Control-F11, otherwise hit it until the cycles is ~500 (again what ever feels right). As always Control-F12 increases the cycles and Alt-Enter puts DOSBox into fullscreen mode. Now to summarize when you want to play the game from now on, just do one of the following in DOSBox. Any questions or comments just let know. Thanks! Rising Tide – New Rewards for the Month of April! Want a Sneak Peek at New Rewards? Follow @UOHerald on Instagram!